Light propagating in a layer of scattering nanoparticles, shows the principle of diffusion - like tea particles in hot water. The deeper light is penetrating into the layer, the lower the energy density. 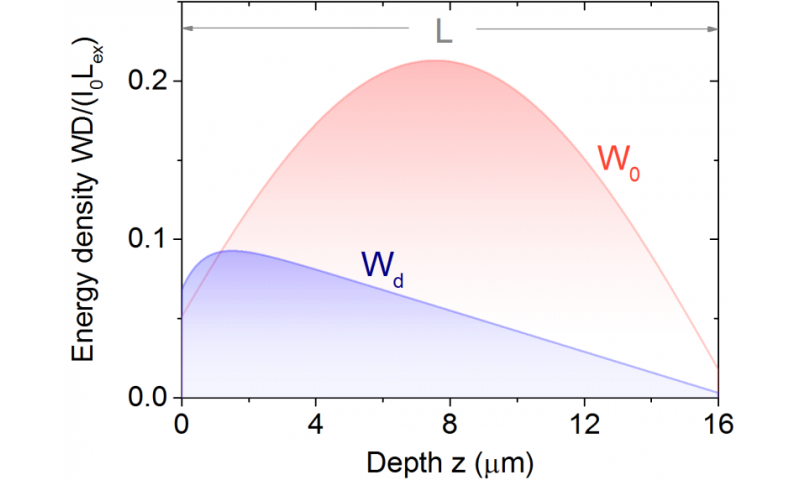 Scientists of University of Twente's Complex Photonics Group, however, manage to turn this falling diffusion curve into a rising one, by manipulating the incident light. More light energy inside an opaque layer, is the result, which could lead to solar cells or LED's with better yields. The results are published in New Journal of Physics. The randomness in the UT experiments exists of a layer of white paint. Light that's falling on the collection of zinc oxide particles the paint is made of, will be scattered by the particles. It will start interfering with light, scattered from neighbouring particles. Nevertheless, it will spread out in a uniform way. Theoretically, the energy density will show a linear fall-off with penetration depth. The scientists of the Complex Photonics Group (MESA+ Institute for Nanotechnology) did not take this for granted and worked on a way to turn the falling curve into a rising one, thus enhancing the energy level inside the layer. Following the fundamental diffusion curve, the energy density rises until half of the layer and then falls off. Experimental setup for measuring light falling on and moving through an opaque layer, using fluorescent microscopy to monitor the results. But how to do that without altering the layer? And how to look inside the opaque layer to check if it works? First of all, the scientists don't alter the layer, but the light. Their 'wave front shaping' technique that was developed earlier on, leaves the way open to program the light waves in such a way that they choose the best pathways and show a bright light spot at the backside of the layer. This technique is also suitable for active control of the diffusion process. But how to prove that light moves according to the desired curve? The scientists mix the paint particles with fluorescent nano-size spheres that act as reporters inside the layer. The local energy levels inside the layer are shown by the fluorescent spheres emitting light, with a highly sensitive camera at the backside of the layer measuring total fluorescent intensity. The measured energy levels highly agree with the enhanced diffusion curve. Thus, significantly more light energy can be entered into a scattering medium. In solar cells, more light would be available for the conversion into electrical energy. White LEDs can be made more cost-effective, and better lasers with a high yield can be developed. In medical applications, better control of the illumination of tissue is possible. First of all, the scientists prove that it is possible to 'trick' light inside complex media, which is quite a challenge.